The wait is finally over. 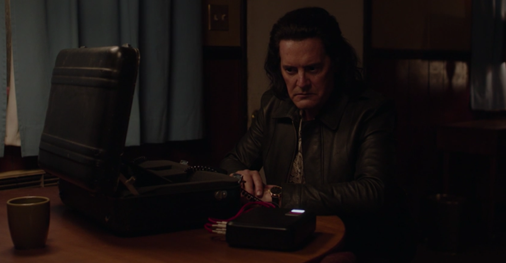 Twin Peaks, season 3 begins with parts 1 & 2. Hear Tom and Ron’s immediate reactions as they attempt to make sense of the world of Twin Peaks, 25 years later. Michael J Anderson went on a rant on facebook implying David Lynch killed Jack Nance and raped his own daughter. That is why he will not be in the show. Google his name and Lynch rant and you can read the whole thing. Yeah, I was going to reply about this too. Apparently MJA wanted too much $ to reprise his role, was turned down, then exploded on FB. I loved these two episodes, personally. This is pretty pure unfettered Lynch and demonstraby a very different creature to the original. I do miss some of the stuff from the original series and most especially Cooper being Cooper but between how off the rails much of season 2 got after the resolution of the murder and the fact that TV is now a very, very different beast from what it was in the early ’90s means that it absolutely had to go in a very different direction. It’s too early to tell how the show will go in the long run (I also haven’t watched eps 3 and 4 yet) but this is compelling, wildly surrealistic stuff so far that is somehow all the more compelling by how slowly it moves. But yeah, good idea not to do full on recaps because good luck summarizing whatever the hell is going on in these episodes!